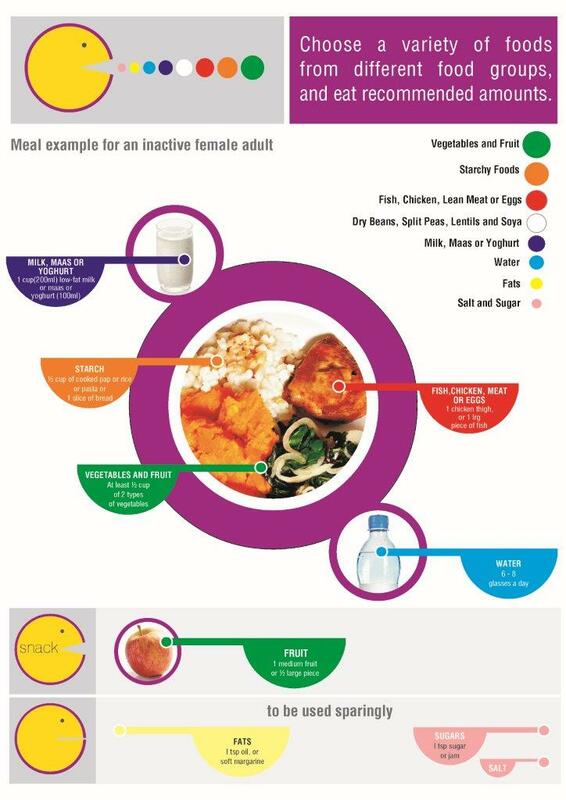 National Nutrition Week 2014: Choose your portion with caution! 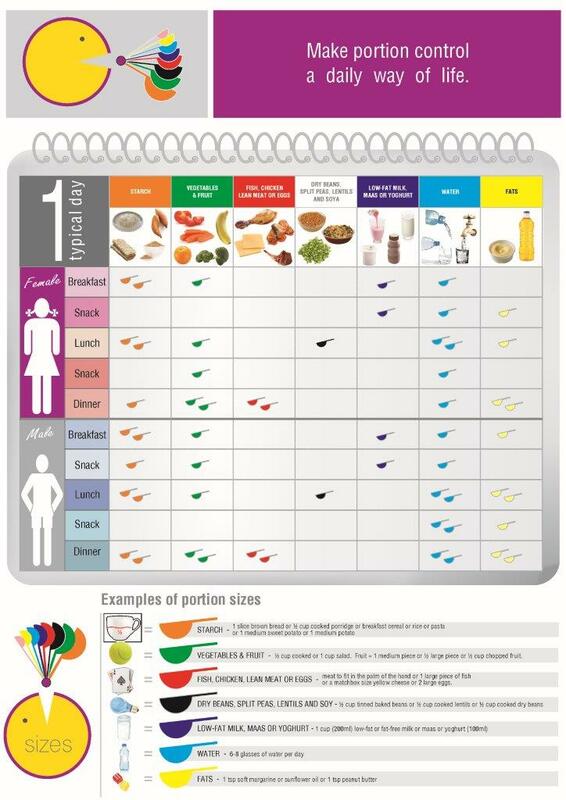 Home 2018 June 21 National Nutrition Week 2014: Choose your portion with caution! South Africa’s rising obesity epidemic prompted the Department of Health and its partners for National Nutrition Week 2014 to focus this year’s campaign on raising awareness of the importance of portion control. Statistics show that increasing numbers of South Africans are overweight or obese, with the problem at its worst among adult women and preschool children. Over 40% of adult women are classified as obese and obesity in adult women has increased in the last decade from 27.5% to 40%. In the age group two to five years, 18.9% of girls and 17.5% of boys are classified as overweight. Significantly, over the past decade, the prevalence of overweight preschool boys and girls has risen sharply from 10.6% to 18.2% – an issue which Lynn Moeng, Chief-Director of Health Promotion and Nutrition at the Department of Health says cannot be ignored. Inaugurated 15 years ago, the event is a vital public health intervention and is jointly planned by the Department of Health, the Association for Dietetics in South Africa (ADSA), the Consumer Goods Council of South Africa (CGCSA), the Heart and Stroke Foundation and the Consumer Education Project of Milk SA (CEP). National Nutrition Week 2014 will run from 9 to 15 October. Research also indicates that the rise in obesity rates have been paralleled by increases in the portion sizes of many foods and the prevalence of eating away from home. One research study found that people consumed at least 30% more food due to large portion sizes, including pre-packaged snacks and beverages. The survey also found that people didn’t adjust their intake at their next meal to compensate for having eaten those foods. Another study, the 2008 South African Youth Risk Behaviour Survey, found that around 26.5% of 13-19 year-old learners ate a supersized portion each time they ate fast foods, which van der Riet says highlights the need for widespread public education about portion control and food choices. However, evidence does show that after education and training, parents are more able to accurately estimate their children’s portion size. “During National Nutrition Week 2014, communications will be aimed at providing the community with practical ways to help them eat less such as using smaller plates, bowls and utensils, repackaging snack foods into individual-sized portions, not eating in front of the television and encouraging children to take a lunchbox containing healthy snacks to school,” says Moeng. Whilst controlling portion size is an effective, simple, reliable and sustainable tool for weight management, eating large amounts of food is just one of the reasons why people become overweight or obese. Eating high-energy foods that are high in sugar, fat and salt, not eating a variety of foods from the different food groups and not doing sufficient physical activity all lead to weight gain and increased health risks. As more and more South Africans become overweight or obese, their risk of chronic diseases, diabetes and some cancers increases, said ADSA president, Claire Julsing Strydom. The 2012 SANHANES report found that two out of five South Africans consumed food low in dietary diversity indicative of a diet of poor nutritional quality, with over a quarter of people consuming a low amount of fruit and vegetables. “We need to create awareness of the importance of eating a variety of foods at each meal – preferably from two or more of the different food groups –and in the recommended amounts according to age, gender and level of physical activity,” she said. “A high salt intake, which can lead to increased risk of high blood pressure, heart disease and stroke is an additional concern associated with portion distortion,” says Dr. Vash Mungal-Singh, CEO of the Heart and Stroke Foundation SA. The World Health Organisation recommends that adults eat no more than a teaspoon (5 grams) of salt a day from all sources, and although new legislation will limit the salt content of many prepared foods such as bread, awareness of the salt content of foods is crucial, added Mungal-Singh. “Increasingly more South Africans tend to eat at restaurants and buy fast foods and other processed foods where portion sizes are bigger than normal – and therefore the salt content is higher – whereas they should be choosing a variety of foods from different food groups. The messages of National Nutrition Week 2014 have been carefully chosen to counteract these risky lifestyle habits and to provide South Africans with practical options for healthier choices,” added Maretha Vermaak from the CEP. Overweight and obesity are affecting the majority of South Africans, especially adult women and preschool children. This is putting South Africans at risk for chronic diseases, such as heart disease and strokes, diabetes and some cancers. (c) Not eating a variety of food from the different food groups. Meals should not be high in sugar, fat or salt. Achieve this by not adding extra fat, sugar or salt to your food when cooking or by not buying ready-to-prepare or ready-to-eat meals. Serve the correct portions of food onto individual plates, instead of putting serving dishes on the table. This will avoid being tempted by second or more helpings. Use smaller plates, bowls, and serving utensils. Plates with a darker-coloured rim can also help to eat smaller portions, since one will tend to only serve food on the lighter-coloured portion of the plate. Use a smaller glass to limit the amount of drinks or beverages consumed at a time. Drink lots of clean, safe water. Keeping excess food out of reach may discourage unintentional overeating. If you don’t buy it you won’t be tempted to eat it. Be aware that your body may only experience feeling “full” sometime after eating your meal. Therefore, eat slowly, chew properly and pay attention to your body’s internal cues to avoid overeating. Do not eat in from of the TV as this may lead to being distracted and not paying attention to signals of becoming “full” thereby leading to overeating. Stick to regular meal and evenly-spaced snack times and do not skip meals. This means having small meals (i.e. breakfast, lunch and supper) every day with small healthy snacks in-between if necessary. Vegetable sticks or fruit and low fat of fat free yoghurt or milk are good examples of healthy snacks. Don’t eat too late at night or just before you go to bed. Encourage children to take a lunch box and healthy snacks such as fruit and yoghurt to school and to avoid buying meals and snacks that are high in sugar, fat and salt. Many restaurants serve more food than is appropriate for one person. Control the amount of food that ends up on your plate by sharing a meal with a friend or asking the waiter to put half the meal in a “doggie bag” or “take away container”. Alternatively order a salad and a starter as your main meal. When ordering meals from restaurants, order a small or regular portion size instead of a large portion and have salad or vegetable(s) to complete your meal. Limit the intake of deep-fried foods and rather choose foods that are steamed, grilled or baked. Limit the intake of sugar-sweetened beverages (like fizzy drinks and sweetened juices) and replace with unflavoured water, milk, or maas. 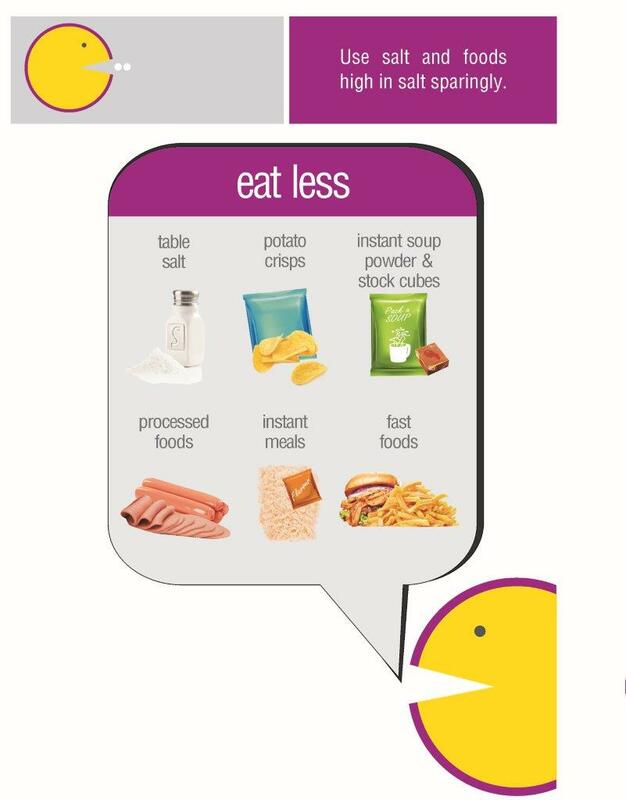 Choose healthier low fat, low salt snack options eg: air popped corn. When eating or snacking in front of the TV, put a small amount in a bowl or container and leave the rest of the package in the kitchen. Snack foods that are bought in bulk should be portioned into individual-sized bags. Store large containers out of sight in a storage closet, cabinet, or garage. Keeping healthier foods within easy reach means you’ll be more likely to eat more of these foods. Place fruit in a large bowl on the counter and serve cut vegetables as the family arrives home from school or work. Buy fresh, plain frozen, or canned “no salt added” vegetables, meat, fish or chicken. Rinse canned foods like beans to remove some of the salt (sodium). Use herbs, spices, and salt/sodium-free seasoning blends in cooking and at the table instead of salt, canned soups, salad dressings, stock powders/cubes, and remove the salt shaker from the table. Choose food products with the Heart Mark as these are lower in fat, saturated fat, cholesterol, sodium (salt), added sugar and are higher in fibre (where applicable).